snow days call for pancakes! Tired of the snow, ice and sub zero temps in the Northeast USA! It’s time for some really tasty comfort food. Let’s start with Breakfast. I created this new recipe while stuck in the house during a blizzard last week. 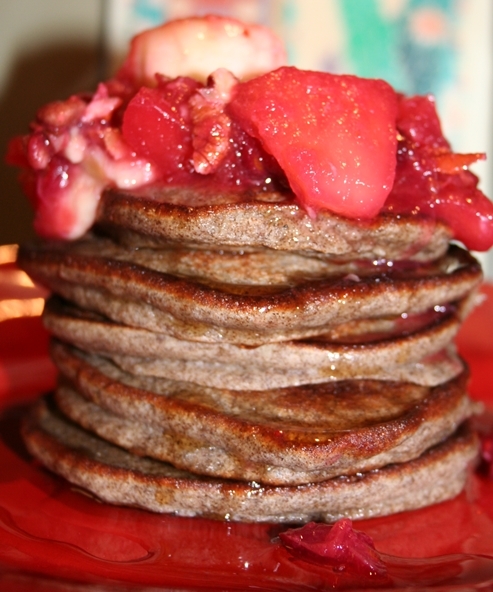 I love the combination of buckwheat and spelt flour. Buckwheat is gluten free but spelt is an ancient wheat that many people who are wheat sensitive can tolerate. The trick for making good, nutritious meals is having all the right ingredients. This might be a challenge if you are trying to eat gluten, wheat or dairy free, and using natural sugar substitutes. All of these ingredients are now available in supermarkets or your local Health Food Store and the flours have a long shelf life so just stock up and store in airtight containers for freshness. You can substitute whole milk and butter for soy milk and oil. And, use an egg substitute and eliminate honey if you are Vegan. Enjoy! In a large bowl mix together 2 eggs, 1 1/2 cups almond or soy milk. Beat in 2 Tbl. olive oil, 2 Tbl. Agave syrup, maple syrup or honey. In another bowl mix together 1 1/4 cup spelt flour, 1/2 cup buckwheat flour and 1/2 cup brown rice flour. Add 1 1/2 tsp. baking powder and 1/2 tsp. baking soda. Grate 1 tsp. fresh nutmeg and add. Slowly pour wet into dry ingredients, mixing with a hand blender or in a food processor. Batter should be thick but not heavy. On medium heat, warm up a griddle or fry pan. Add a Tbl. of oil or butter. Pour 1/3 cup of batter into pan. Cook until pancake is bubbly, flip and cook for no more than a minute. Keep warm on a baking sheet in low temp.oven. Cook 1 cup fresh cranberries in 1/2 cup orange juice, 1 Tbl. honey, 1 tsp. vanilla and 1 Tbl. Agave syrup. Add 1 chopped, peeled apple and cook til cranberries and apples are soft. Take off heat and add 1/2 cup chopped, toasted pecans. Stack pancakes, spoon over compote and drizzle with maple syrup. Yum!!!! Comments Off on snow days call for pancakes!